Could Anything be Finer than Peach Cobbler? July in Johnston County is harvest season for a bounty of vegetables which we love, but can anything be sweeter than sun-kissed peaches? 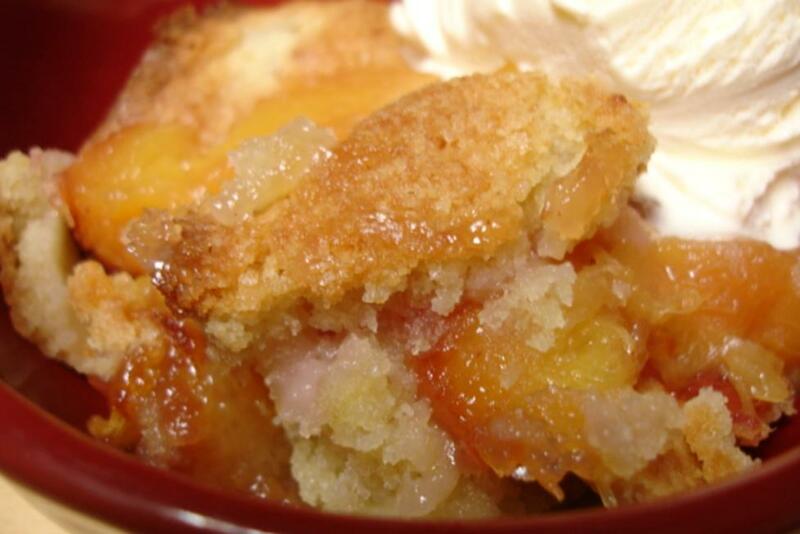 And in the tradition of keeping it simple, which is really the definition of Southern cooking, Peach Cobbler is a must-have recipe in any great cook&apos;s arsenal. This recipe works best with peaches, blueberries, and blackberries as it&apos;s light, buttery and crispy. Peeled and sliced, 1/2 cup sugar stirred into peaches to create juices, let set in the refrig. as you prepare the rest of the recipe. Mix all three ingredients well in a small bowl. Melt 1/2 cup (one stick of butter) in a 13 x 9 glass cooking dish. Pour sugar/flour/milk mixture on top of the butter, then place the peaches on top of this mixture -- DO NOT STIR. Baked in 350 degree oven for appox. 45 minutes until top is crispy and brown. (everyone will want the crispy edges -- they do around our house!) Serve with vanilla ice cream or fresh whipped cream. The Thompson Orchard in Four Oaks, just off I-95 Exit 90, has been growing peaches for over 35 years. Stop by and get a bushel for eating and freezing so you can enjoy peaches all year round. Peaches freeze very well by just peeling (8 medium), mix with small amount of sugar and place in a large freezer bag (lay them flat so they stack easily), then you can pull out a bag with the correct amount of peaches for your cobbler. Your family will thank you! For more great ideas on Agricultural Venues and visiting Johnston County, CLICK HERE.